Are you in the process of choosing a school for your child to start kindergarten? 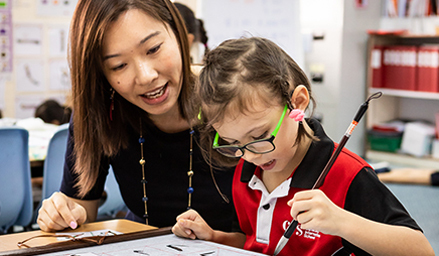 You may have seen that several international schools in Singapore offer bilingual programmes, starting from kindergarten. The thought of enrolling young children in a bilingual programme may be intimidating at first: could this cause learning or linguistic difficulties? Will they be able to actually master two languages? Whilst such concerns are understandable, research has shown quite the opposite: in fact, benefits of learning a second language are plenty! 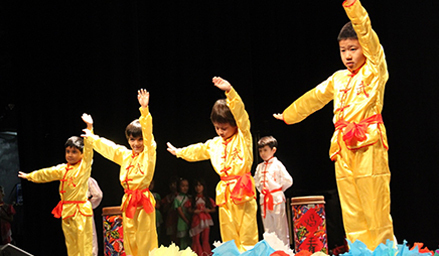 Research has shown that the brain of bilingual children has many cognitive enhancements. Indeed, scans of bilingual adults’ brains, made during a recent study¹, have shown that people speaking only one language had a harder time to focus, whereas bilingual people appeared to be more efficient as they were able to easily ignore irrelevant information. On children, this translates as enhanced spelling and grammar skills, a faster understanding of the concept of numbers, a more creative thinking, and reading at a higher level. Unlike teenagers and adults, young children are often very willing and eager to try out new words and phrases as they don’t have any concerns about getting things wrong and making embarrassing mistakes, which boosts their confidence and nips fear of public speaking in the bud. A study, based on 57 students and using the Janis-Field inadequacy scale, has proven that bilingual students show higher self-esteem than their unilingual peers. Being able to express themselves in more than one language allows children to better socialise and meet new friends. Further to that, they learn about a new culture, traditions and arts, expanding and opening their minds. 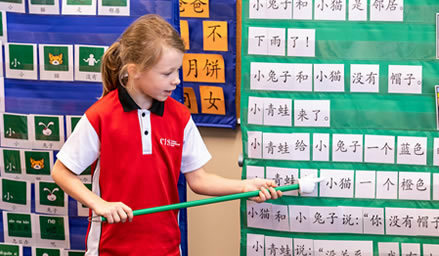 Huali Xiong, author of the best-selling Big Apple Chinese Programme and Principal of Chinese Language and Culture at Singapore’s Canadian International School (CIS), says that where possible, Chinese culture is integrated into their pioneering Chinese-English bilingual programme, so that the children are not just learning symbols but also the correct forms of address, etiquette and behaviour, making them ready to explore the country. As they start the programme in Kindergarten, what matters to young learners is to have fun. Hence, they experience playful, frustration-free learning, through engaging activities like singing songs and playing games. 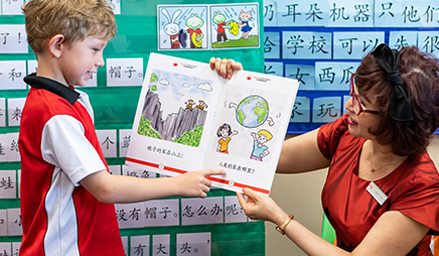 According to Huali Xiong, by the end of grade 1, after just two years in the Chinese-English bilingual programme, CIS students can communicate confidently and read simple books in Chinese without the help of pinyin (romanisation of Chinese characters). Introducing a second language as soon as kindergarten allows children to start learning and practicing at the same time as their mother tongue. As such, since both languages are on the same level, children won’t tend to search for a comparable word in their first language, pushing them to learn the meaning of a word in its own context. Another advantage of starting a second language with no first language interference is the native accent: indeed, young students tend to mimic their teachers’ pronunciation. At CIS, for example, all subjects in their Chinese-English bilingual programme, are taught in each language by native speaking teachers. Students attend lessons in English one day and Chinese the next. Yes, your child is still young - but in the world of today, competition is getting tougher amongst young graduates on the job market. However, bilingualism is a highly sought-after quality. Applicants who master more than one language have an upper hand on their competitors, especially in the trending sectors of tourism, communications and marketing, banking, and law. Another benefit is the pay: it has been shown that bilingual employees are likely to be paid up to 20 percent² per hour more than the position’s base rate. 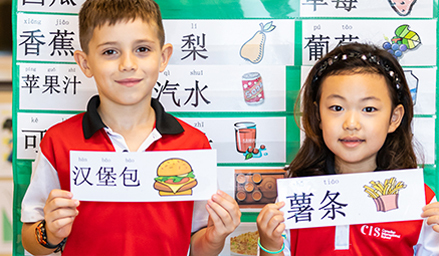 To learn more about CIS’ Chinese-English bilingual programme book a personal tour with their Admissions Team on +6567348088 or register here to attend their next Open House. ¹ Bilingual People Are Like Brain 'Bodybuilders'. Livescience.com. Retrieved 4 March 2019. ² Should I earn more for being bilingual?. Salary.com. Retrieved 4 March 2019. To learn more about CIS’ Chinese-English bilingual programme book a personal tour with their Admissions Team or call us today.